Why do judges need to be ‘sensitised’? Why do judges need to be Ã”Ã‡Ã¿sensitisedÃ”Ã‡Ã–? FOR SOME TIME NOW, INDUSTRY LOBBIES IN INDIA have been on a patent high. Seminars, workshops and road shows have been hosted across the country to make India a ‘patent-conscious’ nation, that is, to turn Indians into a people who will respect intellectual property (IP) rights to a fault. 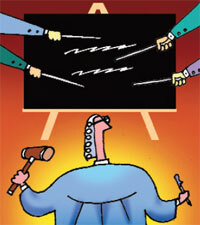 But it is actually a campaign geared to effecting legislative changes that entail higher levels of patent enforcement. It has been a tremendous enterprise with no let-up in energy or ideas, an initiative that gets plenty of backing from the US embassy, which has a zealous official of the US Patent and Trademark Office posted in Delhi as the first secretary for IP. US academia, too, is heavily invested in this Herculean task of educating Indians of various callings, but primarily from those professions that matter: judges, patent attorneys and journalists. No amount of public outrage here or in the US has dampened the enthusiasm of industry lobbies for ‘sensitising’ the Indian judiciary on the intricacies of patent law interpretations. Why are our judges considered deficient in this area and not, say, in industrial disasters, forest rights or the complexities of special economic zones? Even more offensive is the objective of one of America’s self-appointed examiners of India’s patent laws, George Washington University (GWU), which says its India Project aims to see if India’s Patent Act is “in compliance with Indian constitutional standards”! The temerity of such an undertaking notwithstanding, the university has been merrily organising seminars annually in India in collaboration with the Confederation of Indian Industry (CII) and the US India Business Council in Delhi on IP issues, particularly those related to the pharmaceutical industry. Understandably, this has raised hackles across a wide spectrum of opinion here and abroad. The most egregious of these events took place at the end of February in Delhi when its IP Summit not only had drug MNCs, which are involved in legal disputes in India, presenting papers on the contested aspects of India’s patent law, but also make suggestions on cases that were being heard in the courts. Such one-sided summits have been staged for the past seven years. Undeterred by such criticism, the Federation of Indian Chambers of Commerce and Industry (FICCI) has taken the baton from the CII to carry on their self-appointed task of tutoring judges. Last weekend, July 24-25, it hosted the Judges Roundtable 2010 at Uttan (Bhayander), near Mumbai, to focus on challenges the judiciary is expected to address. The excuse this time: “the changing scenario of technology and trade policies and development of the law”. FICCI boasts that it has been intensively involved in protection of IP rights and “has taken a lead role in various sensitisation programmes as well as in training enforcement agencies, including police and customs, besides sensitising judiciary on quality and speedy adjudication of IP-related matters”. It’s a disingenuous exercise and the list of participants is a dead giveaway. Take the one at the latest FICCI workshop. Apart from a couple of academics, the others who addressed the sessions were all practising lawyers, some of them noted for their aggressive protection of copyright and patent laws. Also making a presentation was the Business Software Alliance, the grouping of software industry giants like Microsoft and IBM, which is under fire for its figures of software piracy that are based on flawed methodology and are therefore highly exaggerated and make misleading claims about its impact on the overall economy. Apart from the fact that no consumer representative or institution protecting public interests and services is ever invited to these industry seminars, the central question that warrants inquiry is why our judges need sensitisation. The India judiciary has a long history of dealing with patent legislation and its acumen in resolving difficult disputes that balance the interests of all parties has been established in the past five years. Clearly, that’s the reason industry lobbies feel they need to be re-educated.